Brother Jesse Blog: Professor Johanna Fernandez shares inspirational email: "Our Contact Visit with Mumia Abu-Jamal"
Professor Johanna Fernandez shares inspirational email: "Our Contact Visit with Mumia Abu-Jamal"
Heidi Boghosian and I just returned from a very moving visit with Mumia. We visited yesterday, Thursday, February 2. 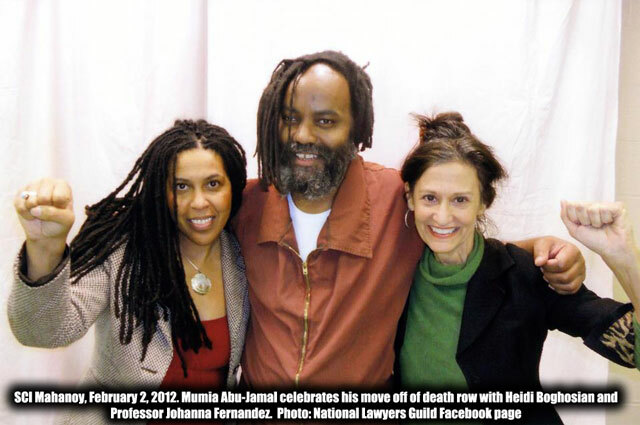 This was Mumia's second contact visit in over 30 years, since his transfer to General Population last Friday, Jan 27. His first contact visit was with his wife, Wadiya, on Monday, January 30. Unlike our previous visits to Death Row at SCI Greene and to solitary confinement at SCI Mahanoy, our visit yesterday took place in a large visitor's area, amidst numerous circles of families and spouses who were visiting other inmates. Compared to the intense and focused conversations we had had with Mumia in a small, isolated visiting cell on Death Row, behind sterile plexiglass, this exchange was more relaxed and informal and more unpredictably interactive with the people around us...it was more human. There were so many scenes of affection around us, of children jumping on top of and pulling at their fathers, of entire families talking intimately around small tables, of couples sitting and quietly holding each other, and of girlfriends and wives stealing a forbidden kiss from the men they were there to visit (kisses are only allowed at the start and at the end of visits). These scenes were touching and beautiful, and markedly different from the images of prisoners presented to us by those in power. Our collective work could benefit greatly from these humane, intimate images. He looked young, and we told him as much. He responded, "Black don't crack!" We laughed. He talked to us about the newness of every step he has taken since his release to general population a week ago. So much of what we take for granted daily is new to him, from the microwave in the visiting room to the tremor he felt when, for the first time in 30 years, he kissed his wife. As he said in his own words, "the only thing more drastically different than what I'm experiencing now would be freedom." He also noted that everyone in the room was watching him. One of the highlights of the visit came with the opportunity to take a photo. This was one of the first such opportunities for Mumia in decades, and we had a ball! Primping the hair, making sure that we didn't have food in our teeth, and nervously getting ready for the big photo moment was such a laugh! And Mumia was openly tickled by every second of it. When the time came to leave, we all hugged and were promptly instructed to line up against the wall and walk out with the other visitors. As we were exiting the prison, one sister pulled us aside and told us that she couldn't stop singing Kelly Clarkson's line "some people wait a lifetime for a moment like this." She shared that she and her parents had followed Mumia's case since 1981 and that she was overjoyed that Mumia was alive and in general population despite Pennsylvania's bloodthirsty pursuit of his execution. We told her that on April 24 we were going to launch the fight that would win Mumia's release: that on that day we were going to Occupy the Justice Department in Washington DC. She told us that because she recently survived cancer she now believed in possibility, and that since Mumia was now in general population she could see how we could win. She sent us off with the line from Laverne and Shirley's theme song - "never heard the word impossible! "- gave us her number, and asked us to sign her up for the fight. We're still taking it all in. The journey has been humbling and humanizing, and we are re-energized and re-inspired!! In the words of City Lights editor, Greg Ruggiero:"
"Long Term Goal: End Mass Incarceration. Short Term Goal: Free Mumia Abu-Jamal!" WTH?! Mumia is Still Being Unjustly Held in “The Hole” at SCI Mahanoy. Sign The Petition! Amazing report! Well written & I felt every bit of the love & emotion!